On the New England skis scene, its birthdays and buyouts, terrain parks and tree skiing, mountain coasters and zip line mania. Stowe is now owned by Vail Resorts, and part of the Epic pass! Vail bought Stowe ski resort for $50 million, but not the Spruce Peak village or the Stowe Mountain Lodge. Burke Mountain opens the Hotel Burke – a ski in ski out 116 room hotel and conference center. Jay Peak’s Tram Haus Lodge and Spa, Hotel Jay and Stateside Hotel (all new in the past few seasons) are getting rave reviews. Waterville Valley under The Sununu family (and NH’s new governor) opens their much anticipated Green Peak with a new quad, 8 trails and 40 acres of skiing. Magic Mountain in Vermont now has a new owners at this humble Vermont ski resort, plans include running both chairlifts this winter. 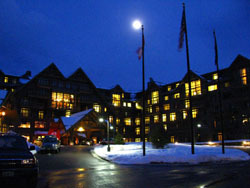 Okemo is now a Vail Resort, along with sister Mount Sunapee. Okemo recently installed a high-speed quad – Sunbowl Express (Okemo’s replaced lift), and addedtwo bubble chairs – a six-passenger chairlift with heated seats and a bubble cover – the orange Sunburst Express that whisk skiers and riders to the Okemo’s summit in six minutes and the Jackson Gore Express quad with a bubble. Ragged in New Hampshire has a new high speed lift up Spear Peak. The Hermitage Club, a Private Club opened in 2011 accepting up to 1500 memberships, installed a new six-passenger chair with bubble and heated seats. Being a member at Hermitage, $75,000, provides private skiing on Haystack Mountain, access to a magnificent Clubhouse, concierge service and ski valet. Like the Yellowstone Club of the East, this ski resort offers the well-heeled in ski boots a place to play and belong with out lift lines or crowded base lodges. Skiing is for members only. Sunday River now has 870 acres moving it into the second largest ski resort spot just behind the Loaf at #1. Sunday River continues to ante up their awesome snowmaking, their parks with the T72 terrain park trail off 3D, and improves their new Kids Adventure Trail and chalet of Eddy the Yeti. Spruce Peak is a new triple chair lift with conveyor loading system. Sugarloaf opens more of Brackett Basin tree skiing to bring their acreage to the largest in New England at 1,056, serviced by cat skiing. Sugarloaf’s King Pine and Timberline Quad both received significant maintenance after two major lift incidents in three years. Part of Sugarloaf 2020, The Loaf plans to continues its glade and backcountry terrain expansion on Burnt Mountain to become the largest boundary to boundary ski resort east of the Rockies, but they need some new lifts. Maine’s Saddleback will not open for a second ski season without an investor/buyer for this Rangeley Lakes ski area. Similarly teh Balsams Resort in New Hampshire is not currently opened for skiing, but Les Otten has put together a dream team of developers to revitalize and expand this grand resort in northern New Hampshire and expand the ski area bit time – stay tuned. Killington hosted the Women’s World Cup in November. The Peak Lodge at Killington’s summit off the K-1 Gondola at 4,241′ opened January 2014 providing panoramic dining for downhillers. Killington wins first to open in the East for 2016 -2011, flexing their big K snowmaking investments! Cranmore has a new e-groomer, that is entirely electric and recharges while grooming downhill. Also at Cranmore a new base village with condos is underway, a new triple lift was added on the South Side in 2013. Peak Resorts now owns Wildcat, Attitash and Crotched in New Hampshire and Mount Snow in Vermont plus Hunter in NY, Big Boulder and Jack Frost in the Poconos. For New Hampshire skiers, The Granite Pass is a rockin’ deal since it includes skiing at all three Peak resorts, Attitash, Wildcat and Crotched. The White Mountain Super Pass is also a steal valid at Bretton Woods, Cannon, Cranmore and Waterville Valley. Bromley in Vermont debuted a new base lodge. Serious snowmaking upgrades are on line at Canno n, Sunday River, Mount Snow, Loon, Killington, Stratton, Sugarbush, and Pats Peak. Sugarbush, Stowe and Jay Peak all boast big base village improvements. At Sugarbush, the Lincoln Peak expansion is complete. Zip lines, canopy tours and Mountain Coasters are all the craze. Sunday River, Sugarloaf, Attitash, Gunstock, Bretton Woods, Cranmore and Smugglers’ all have some fashion of zip line or canopy tour open in summer and winter. Okemo, Cranmore Gunstock, and Attitash have installed Mountain Coasters – an open car concept train on a rail system that descends the hillside and can remain open in winter…wee! Look for ski specials, New England Ski and Stay Deals like Sugarloaf and Sunday River’s Children’s Fest in early January including free skiing and kids learn to ski programs to make your family ski vacation affordable. In Quebec skiing, Mont Sainte Anne debuted a new high speed quad, Le Panorama Express, on the South Side – Le Versant Sud, replacing the old triple chair and improving access between the North, South and West sides on this Quebec ski mountain. As for weather, what really rules New England skiing, the Farmers’ Almanac predicts: “a cold snowy winter, have your shovels and sweaters ready.” Bring it Mother Nature, our skis are waxed and ready. See you on the slopes.